You’ve got questions and I’ve got answers. Let’s jump right into this week’s mailbag. Q: Who are the most likely contributors among the freshman class? A: On offense I’ll go with Demarcus Robinson, Marqui Hawkins and Kelvin Taylor. On defense: Daniel McMillian, Marcell Harris and Vernon Hargreaves III. Q: Any surprise starters coming out of Fall camp? A: I think you could see two freshmen (Daniel McMillian and Demarcus Robinson) leave fall camp with starting jobs. With Antonio Morrison still suspended for the first two games, I would expect Michael Taylor to start at Mike and McMillian to start over Kitchens at Will. Q: How concerned are the coaches about the safety position? A: Very. Florida lost a lot of talent from last year and the staff is still waiting for somebody to step up and take the job. Q: Will Ronald Powell be full speed and full contact in camp or brought along slowly? A: Powell sitting out spring camp was bringing him along slowly. He is 100% and will be full speed for the start of camp today. Q: When will Alex Anzalone be cleared to participate in team drills? A: Muschamp’s explanation was a little unclear here. He said that Anzalone was cleared, then he said he would be limited and then said they would need to watch his progression. I think Anzalone will be limited in some contact drills until the staff sees what he looks like, but he should be able to participate in most drills. Q: How much will Floyd be missed on the defensive line? 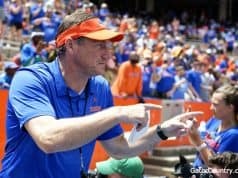 A: Before I started re-watching the season, I would have said that Dominique Easley would be able to play the position that Floyd did and that Florida wouldn’t skip a beat. After watching the games closely, it’s very apparent that Floyd was often the best player on the field at times last year and Florida will miss his ability to disrupt this season. Q: What are the coaches’ feelings towards this year’s team in comparison to last year’s team? A: The staff is very concerned about depth at linebacker, how safety will shake out, and replacing Caleb Sturgis. 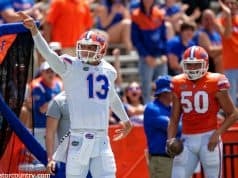 However, they are much more confident in Jeff Driskel and the offense this season. The expectation remains the same every year at Florida, no matter who is on the roster, it’s Atlanta or bust for the Gators. Q: Project the starting offensive line (left to right) and placekicker. A: Humphries, Garcia, Harrison, Halapio, Green. Austin Hardin at kicker. Q: Who are the emotional leaders and gym rats? A: I’m not sure what you mean by emotional leader. Jon Harrison, Jon Halapio and Jeff Driskel have stepped up as leaders on the offensive side of the ball. Dominique Easley, Ronald Powell and Antonio Morrison have stepped up as leaders (on the field) for the defense. I’ve been told that Cam Dillard is a monster in the weight room. The strength staff keeps throwing more and more at him and he just won’t break. Halapio and Tyler Moore are the two guys who dominate the bench press. Both lift over 400 lbs. on the bench regularly. Q: How is receiver looking? A: Quinton Dunbar has jumped out as the No. 1 guy here and behind him is a huge group of players who are still competing for playing time. Marqui Hawkins and Demarcus Robinson are two freshmen that have impressed early on. Solomon Patton will have a role in the offense (very similar to his role last season) and Trey Burton will play some slot receiver this season. Latroy Pittman should get a lot of playing time as well because he, along with Quinton Dunbar, is the best blocking wide receiver on the team. Q: Is Staver a gym rat? A: I don’t know if he is a gym rat in the sense that he’s going to throw up ridiculous numbers in the weight room but he’s a quarterback so he doesn’t need to. I have been told that he has done a very good job in the film room and getting into his playbook. I’d rather have a film room rat (is that a thing?) than a gym rat at quarterback. Q: Who are the projected starters on the defensive line? A: Fowler, Easley, Bullard and whoever wins the battle between Orr, Cummings and Jacobs. Q: How are Bryan Cox Jr. and Alex McCalister doing? A: They’re both doing well and should find a way into the rotation at defensive line. Q: What are your thoughts on the Miami game? Do you think Florida wins? A: I think Miami will have one of the best offenses that Florida plays this season. They have eight starters returning on defense, but it’s a defense that finished dead last in the ACC in rushing, passing and total defense. I like Florida in this game but I don’t think it will be a blowout. Miami will give Florida a run for their money but the Hurricanes don’t have the defense to come away with the win. Q: Muschamp showed a lot more confidence in the preseason press conferences than he did last year. Is that just show, or does he really believe we can get to the SEC Championship Game and more this year? A: The staff is worried about a couple of positions but like I said before, the expectation at Florida is the same every single season. And if recent history is any indication, if you win the SEC, you have a very realistic shot at playing for a national championship.